Welcome to the Intel and mobile application resource section. In this section, you will find various resources to get started developing mobile applications to interact with your Intel projects using Evothings Studio. Intel Corporation is an American multinational corporation headquartered in Santa Clara, California and is one of the world largest and highest values semi-conductor chip makers. It is the inventor of the x86 series of micro-processes, the processes found in the majority of personal computers. 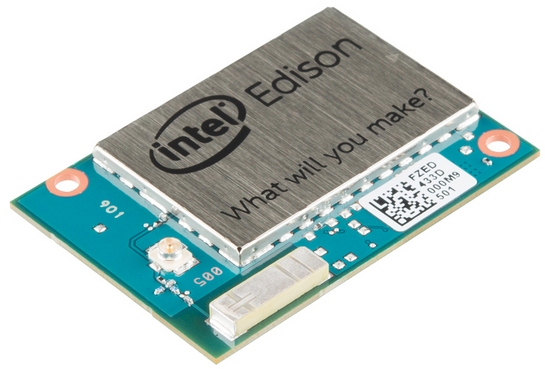 The Intel Edison is a tiny computer offered by Intel as a development system for wearable devices. The system was initially announced to be the same size and shape as an SD card and contain a dual-core, dual threaded Intel Atom™ CPU at 500Mhz and an Intel Quark micro-controller at 100 Mhz communicating via Bluetooth and WiFi. Below are a number of resources on our website to support getting started with developing mobile apps using Evothings Studio. Enjoy discovering a new world of possibilities combining your Intel projects and mobile applications!